“Weird Al” Yankovic (with Jodi DiPiazza) performing in New York City earlier this year. A lot has changed since then, of course. The Internet has accelerated every aspect of pop culture, and funny songs and videos are a dime a dozen. Yet Yankovic, who brings his tour to the Wilbur Theatre for three shows on June 2-3, remains not only hugely popular but vital, as up-and-coming comedians tout his influence and invite him on their podcasts. Last year’s “Mandatory Fun” — the final album for his record contract with Sony — reached No. 1, the first comedy album to top the Billboard charts since 1963. “Weird Al” Yankovic has, somehow, become hip. He pointed out that “Word Crimes,” his grammar-snob parody of “Blurred Lines,” came out nearly a year after the Robin Thicke hit. While this is a risk he has always run, the frenzied pace of entertainment consumption has made that lag time more and more detrimental. So far so good. 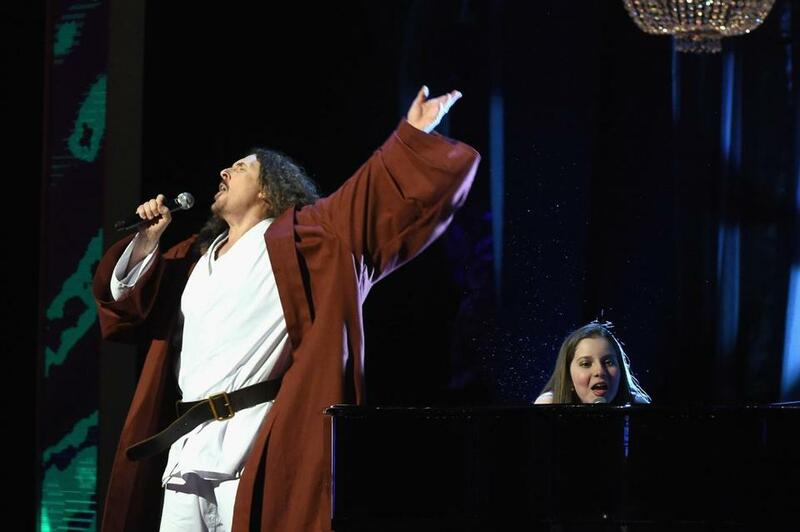 Over the years, Yankovic, 55, has skewered songs by everyone from Jackson to Nirvana, Lorde to Don McLean (his Star Wars-themed parody of “American Pie” is nothing short of an epic). Actually, “skewered” may be the wrong word: He hardly ever mocks the original song or its artist. There are a few exceptions — his Nirvana parody, for example, ribbed Kurt Cobain for being unintelligible — but for Yankovic, it’s more about contrast. Fans like Sherwin will have to wait for new material until after Yankovic’s current tour, which will bring him around the world through October. Like his songs and videos, Yankovic’s shows are known for their high production values: think video displays, an absurd number of costume changes, and, of course, meticulous attention to parodic detail.